This week one of my nursing professors from Hope visited the nursing students at Chicago semester and took us out to dinner. 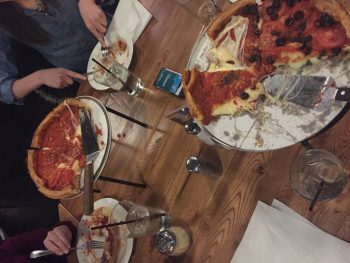 The six of us went to Giordano’s on Rush St. for some Chicago deep dish, which is my absolute favorite kind of pizza. J If you have never been, it should definitely be on your list of places to try while in the city. It was awesome to catch up and discuss living and working in the city with my classmates. We each shared what our experiences have been like so far and what we all have learned and accomplished. I appreciated hearing about what similar or different situations others have been through so far during their internship. 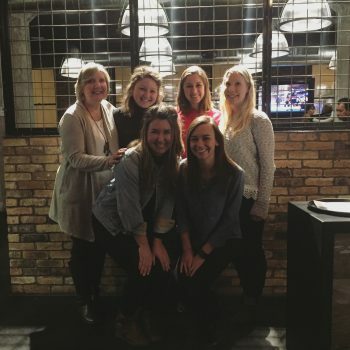 We talked about our commutes, the types of patients we primarily treat, what we hope to do while still in Chicago, and could not help from laughing at the many mistakes and awkward moments nursing students experience on a weekly basis. If you know anything about nursing students, you may know that we are often described as type A, goal-oriented, career-driven, workaholics, yet compassionate and caring for others. I often fall into this category as nursing school requires students to study for long hours for multiple exams each week and preparation for clinicals. As I continue my internship at Northwestern, I am working towards giving myself more grace in light of my failures and mistakes. Nursing school is competitive and it instills in you this idea that no mistakes can be made, and part of this is really true when people’s lives are at stake. The past couple of weeks I have dealt with some difficult patients who have shaken my confidence and made me doubt my own ability. I am keeping focused on the fact that I am still a student, and it is okay to make mistakes and not know all the answers. I work really hard, but sometimes I am going to fall flat on my face. It is important to be willing to learn from failure rather than let it hold you back. I think this is relevant to all students in every major. I hope I make a really good nurse one day, but for now I am continuing to learn and ask difficult questions. I am realizing that making an error is one way to learn how to never make the same mistake. I was grateful to discuss both the good and the bad over some pizza and company. I continue to praise Jesus for helping me see that I cannot always be perfect. Sometimes you have to be more like Taylor Swift and just shake it off.